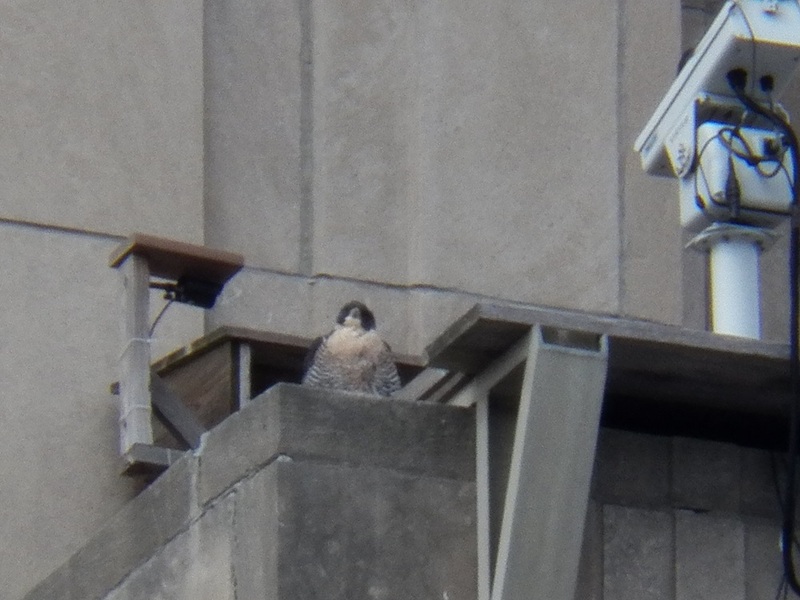 As we wait for Beauty and Dot.ca’s first egg…..
You may have heard that Rochester and the surrounding area has had some pretty nasty weather. First a wind storm with a recorded gust of 81 mph, that caused power outages to over 100,000 homes in the area. Then a snow storm that dumped close to 30 inches of snow. Needless to say, it’s been a little crazy around here. 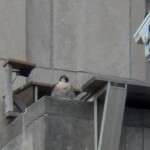 So, when I heard the sun was coming out this afternoon and the temps were soaring into the 40’s (F), it was time to head out for a falcon head count. I first checked out the BS and DSS locations. 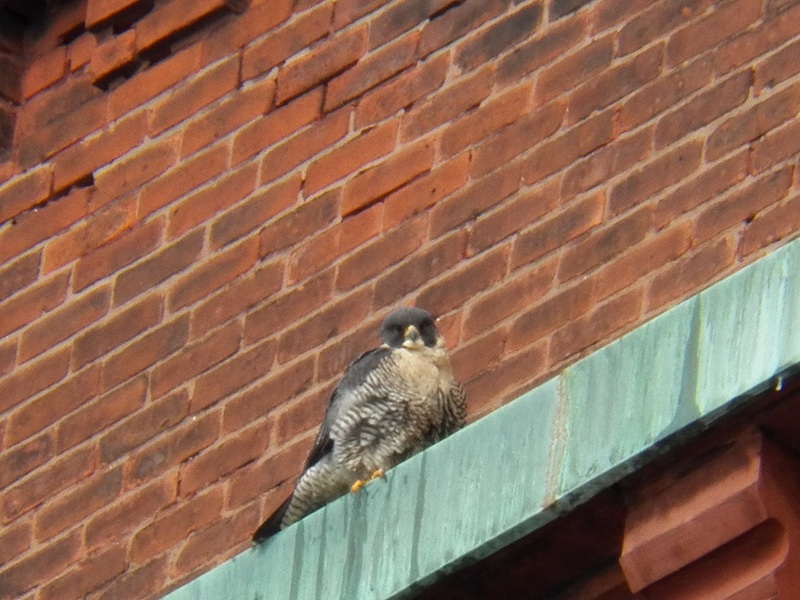 No falcons were found in either location. 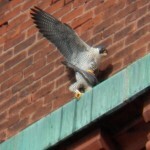 Could our unbanded female and her friend have headed out to nesting territories of their own? Time will tell. Downtown I found Beauty on the base of the Mercury statue. She had a full crop, but it didn’t look like she had any food. 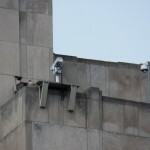 Dot.ca was on the west corner of the top Ibeam on OCSR. I was hoping to see them mate and I was really hoping to get a video. I was lucky, after patiently waiting for about an hour. <— Beauty on the base of Mercury. I found a spot to park my car on Aqueduct St (aka ”the hole”), where I had a good view of Beauty and could wait for Dot.ca to take off from OCSR. It was a long, cold wait. 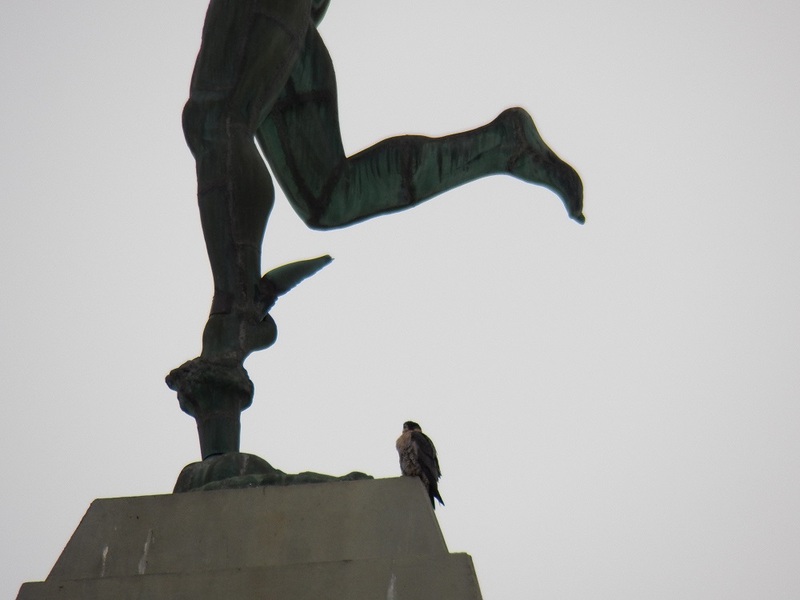 But finally, he took off and headed our way. Beauty was ready for him and so was I! Here’s the link to the video I was able to get. Afterwards Dot.ca headed west towards the Times Square Bldg. 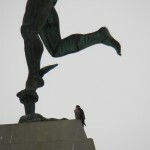 I had to leave for a short while to help out a friend and fellow watcher Brian H. He said to say hello to everyone! 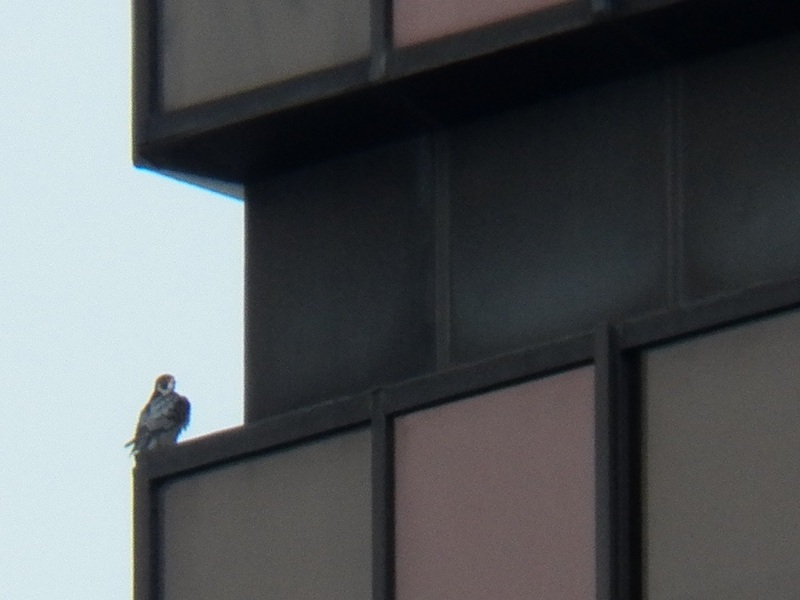 When I returned, Beauty was up at the Times Square Bldg nest box and Dot.ca had returned to the west corner on the top IBeam of OCSR. 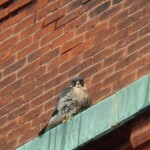 <— Beauty at the Times Square Bldg Nest Box. 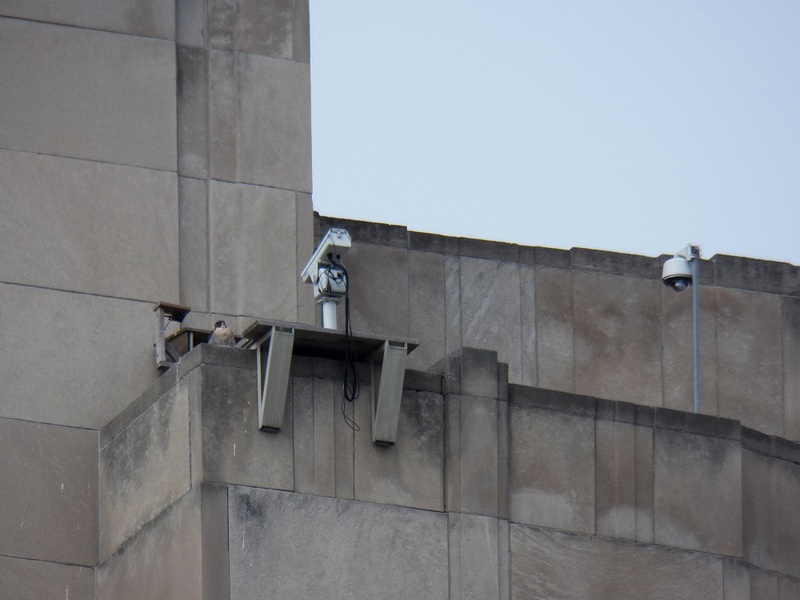 This is where I left them as I ended my downtown, Rochester Falcon Watch. 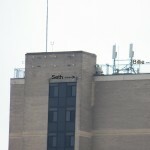 I wanted to check on Billie and Seth at Seneca Towers (ST). 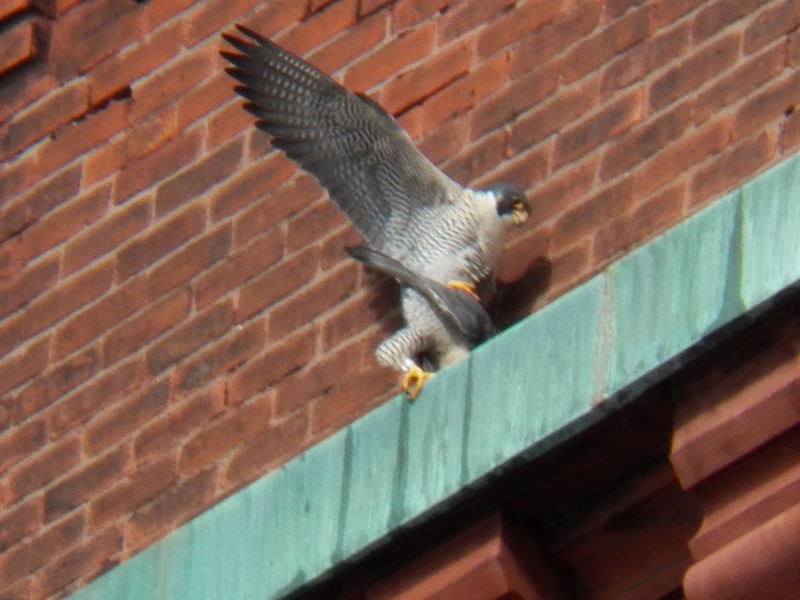 From the parking lot at Maplewood Park, I was able to see two falcons on the building. I assumed that it had to be Billie and Seth and I was very happy to see them after all the bad weather we’ve had. 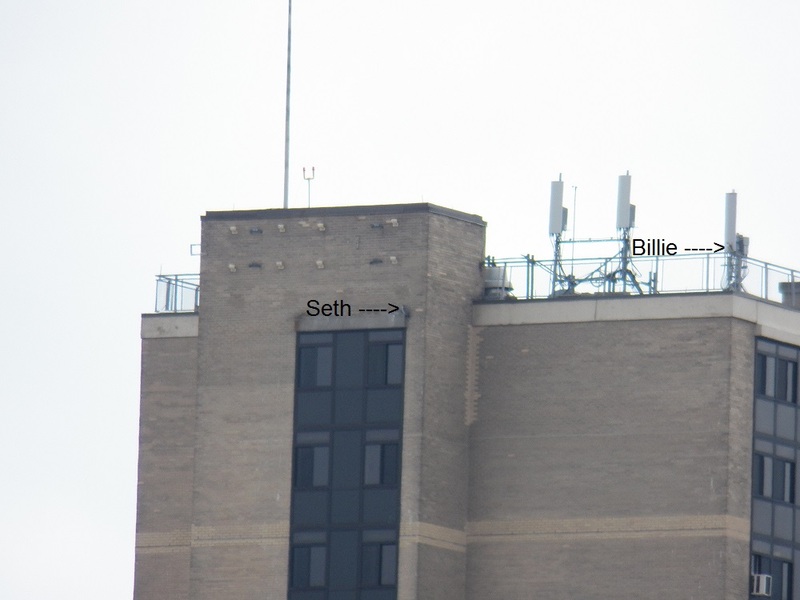 <— Billie and Seth at Seneca Towers (ST). 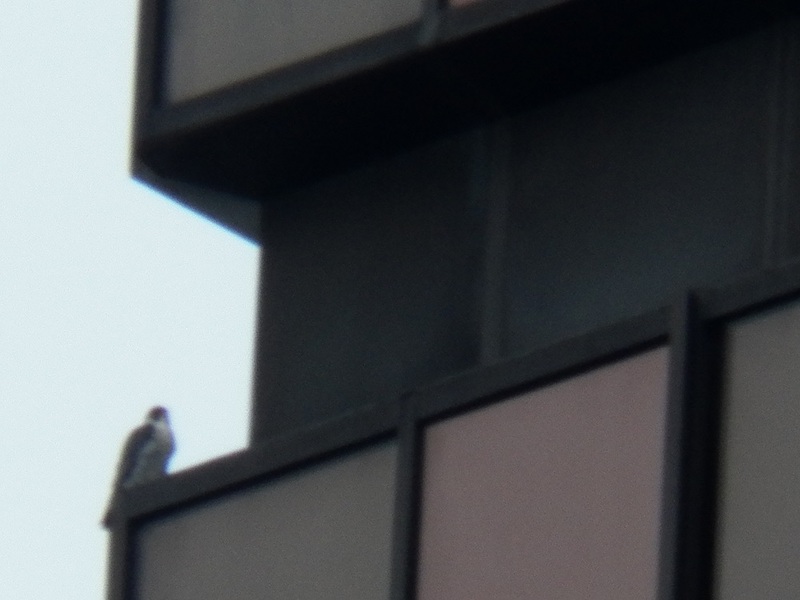 It was nice to get out for a falcon watch today. Especially with the sun shining! Spring will be here very soon! I’ll leave you with a couple of pictures I took of Beauty and Dot.ca last Sunday. Enjoy! <— Beauty on Wilder Bldg. 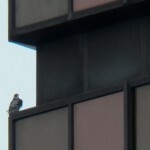 <— Beauty and Dot.ca mating on the Wilder Bldg.